A herald reads a proclamation that Othello has called for a night of revelry to celebrate the annihilation of the Turkish fleet as well as his recent marriage. In a military situation, where facts and actions are crucial, Othello is dominant. But in a domestic world of interpersonal relationships, facts can be fudged and Iago is in his element. Weigel, Moira. "Othello Act 2, scene 2." LitCharts. LitCharts LLC, 22 Jul 2013. Web. 10 Dec 2018. Weigel, Moira. "Othello Act 2, scene 2." LitCharts LLC, July 22, 2013. 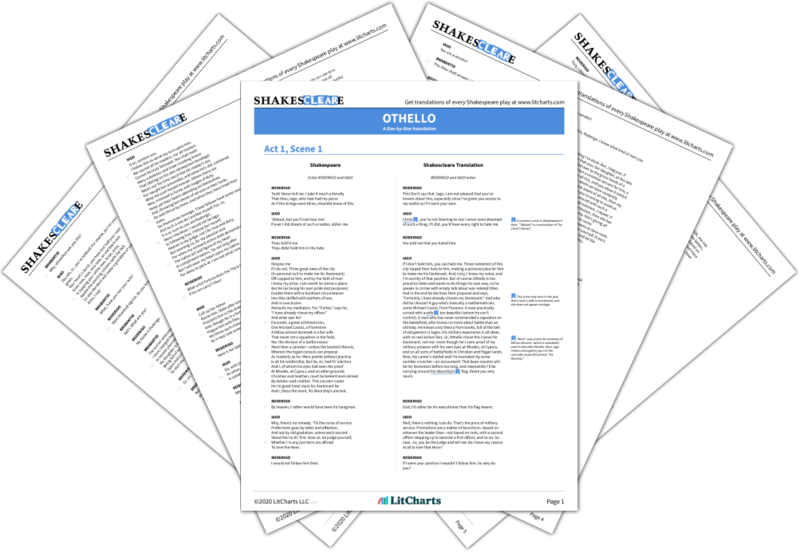 Retrieved December 10, 2018. https://www.litcharts.com/lit/othello/act-2-scene-2.